The Pogo News is getting a makeover — the new Pogo News page will soon be completely redesigned. You’ll still have access to all of the same things you’re used to seeing in the Pogo News, like updates, reviews, and the regular Letters to the Editor and Ms. Netiquette columns. In addition, Pogo can now add videos and better graphics to their posts, and they’re adding a search and will be categorizing their posts with tags so you can find things easier. Here’s a peek at the new Pogo News. Expect this new design and layout to replace the old news page in the near future. 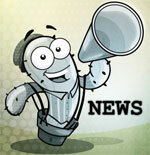 Do you read the Pogo News page? Will these changes make finding news and information on Pogo’s site easier for you? Share your thoughts in a comment below. It looks good to me. Also looks like it will be easy to find what you are looking for. It’s nice and bright. Looks good to me. Will take a little getting used to, as with all Pogo changes… but I like the new graphics and everything seems a little cleaner looking. Only complaint is that I hope they change the background to the Club Pogo dark blue background, and the navigation at the top is missing the Shop button. Wil have to get used to it and to where the links and everything is, I’m so used to know where things are that I will have a hard time at first looking for what I want to read. Oops sorry, forgot to say that I’m sure this will soon be the same format for the Home Page, making it look like the free Pogo home page, and I can say that I’m already hating it.